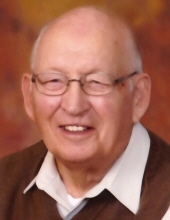 Funeral services for Melvin “Mel” Arthur Weide, 91, Aberdeen, SD, are 11:00am, Friday, January 25, 2019, at First Baptist Church, Aberdeen, Pastor Gary Compton officiating. Burial at Sunset Memorial Gardens. Mel died Sunday, January 20, at Bethesda Home of Aberdeen. Visitation: 3:00-7:00pm, Thursday, family present 5:00-7:00pm, prayer service at 7:00pm, at Spitzer-Miller Funeral Home. Melvin Arthur Weide was born May 31, 1927 in Revillo, SD to Arthur B. and Anna Marie (Krause) Weide. This is the area where he was raised and educated, graduating in 1945. His father owned a general store on Main Street, where Mel worked while he was in high school. He enlisted in the US Navy as a senior and reported soon after graduation. The war ended soon after his basic training, so his time was spent doing office work in Portland, OR until his honorable discharge in 1946. He spent time working in Wisconsin before returning to South Dakota to be near family. Mel was employed with Brevik Wholesale for seven years. Mel loved riding his Harley, flying his plane, hunting, fishing, and roller-skating. Mel met Beverly Gordon in 1949. They began their courtship riding his Harley and spent many hours roller-skating. Mel and Bev were married on June 23, 1952, at Watertown, SD, and they made their home at Lake Kampeska. In 1955, he accepted a job with Metz Baking Company in Aberdeen, where he was employed for 32 years. He also drove school bus and did janitorial work for several years. Mel was a member of the America Legion and the First Baptist Church where he was a former deacon and Sunday school teacher. Mel dearly loved his Lord and his family. Grateful for having shared Mel’s life are his wife of 66 years, Beverly Weide, Aberdeen, children: Craig (Tammy) Weide; Mark (Diane) Weide; Scott (Meredith) Weide; Dawn (Todd) Hammrich; nine grandchildren, thirteen great-grandchildren, sister-in-law, Barbara Weide, step-sisters: Karen (Bruce) Sime and Kathy Grensberg. Preceding Mel in death are his parents, Arthur and Anna Weide; step-mother, Ina Weide; in-laws, Raleigh and Lucy Gordon; grandson, Jeremey Weide; brother, Glen Weide. To send flowers or a remembrance gift to the family of Melvin 'Mel' A. Weide, please visit our Tribute Store. "Email Address" would like to share the life celebration of Melvin 'Mel' A. Weide. Click on the "link" to go to share a favorite memory or leave a condolence message for the family.